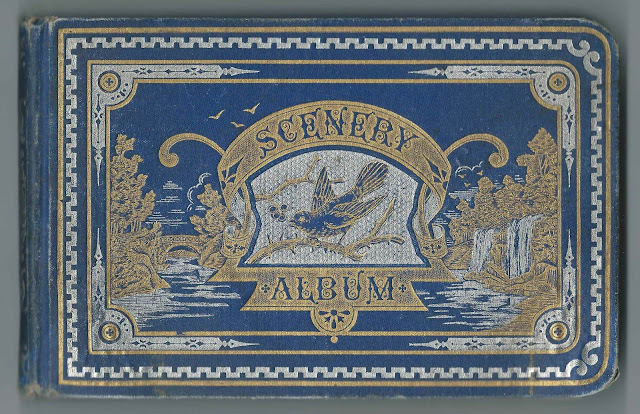 Album kept by Hattie A. Young during the 1880s, during a portion of which she apparently was a student at Derby Academy at Derby, Vermont, which many of the inscribers mentioned. The album measures approximately 7-3/4" by 5" and contains the sentiments of over 50 of Hattie's relatives, friends and schoolmates, as well as numerous full page engravings throughout. An alphabetical list of the inscribers, together with any personal information they offered, appears at the end of this post. Hattie was born in 1862, the daughter of Edward F. Young and Katherine [possibly Katherine Bilodeau (LaJeunesse)] Young, "Kate". Hattie had several siblings, at least two of whom inscribed pages in her album. William F. Young, Hattie's oldest brother, inscribed facing on August 28, 1882. Interestingly, William's future wife, Effie M. Best, also inscribed a page. 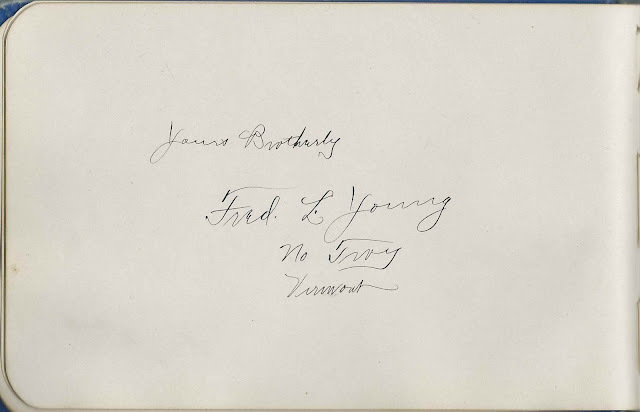 Hattie's younger brother, Fred Lincoln Young, of North Troy, Vermont, inscribed a page. At some point, William and Hattie moved to Colorado, where William was a traveling salesman for the R. F. Moore Garment Company of Newport, Vermont. I didn't find a record of children for them, but I may have missed them. Hattie died in 1934 and William in 1969. They're buried in the Crown Hill Cemetery at Wheat Ridge, Colorado. Bennie Baker of Newport, Vermont; inscribed on March 8, 1883. E. W. Barron of West Charleston, Vermont; inscribed on August 22, 1882. Edwin Wayland Barron, who wife Nell L. (Young) Barron inscribed the right facing page. Nell L. Barron. She was Nell L. (Young) Barron, wife of Edwin Wayland Barron, who inscribed the left facing page. Nell was the daughter of Sophronia (Beaulac or Bolac) Young and Peter Young, who may have been a brother to Hattie's father Edward F. Young. John F. Batchelder of Derby Centre, Vermont; inscribed at Derby Academy on November 9, 1881. John, the son of Charles Batchelder and Abigail (Moon) Batchelder, married Lizzie Mae Robinson on June 18, 1895. Lewis C. Bates of Elkhart City, Illinois; inscribed at Derby Academy at Derby, Vermont, on October 11, 1881. "21 yrs." S. B. Bates, MP of Derby Center, Vermont. Perhaps Stoddard Benham Bates, son of Alonzo Dodge Bates and Catherine (Benham) Bates. Stoddard married Lilla Ann Bates on October 12, 1905. His cousin, Walter L. Bates inscribed the right facing page. Their fathers were brothers. Walter L. Bates of Elkhart City, Illinois; inscribed at Derby Academy on October 12, 1881. Son of William Gustavus Bates, who was a brother to Alonzo Dodge Bates, father of the inscriber of the left facing page: Stoddard Benham Bates. Effie M. Best of St. Albans, Vermont; inscribed at North Troy, Vermont, on April 20, 1883. Effie would marry Hattie's brother William F. Young on December 20, 1883. Selma J. Burt of West Derby, Vermont; inscribed on May 7, 1882. Selma would marry Wilbur W. Hutchins on June 14, 1883. F. Maude Chandler of North Troy, Vermont; inscribed on February 8, 1882. Addie E. Critchtt or Critchet or ? of North Troy, Vermont; inscribed on March 27, 1883. There was an Addie Elizabeth Critchett, born about 1865, the daughter of John Critchett and Mary Eliza (Martin) Critchett, who married Charles Henry Lamb in New Hampshire on January 12, 1910. Carrie C. Croft of Derby, Vermont; inscribed on September 21, 1881. Carielette Cornelia Croft, "Carrie", daughter of William A. Croft and Margaret (Sheridan) Croft, would marry Frank L. Hall on October 26, 1887. Carrie M. Dewing of East Franklin, Vermont; inscribed on October 7, 1882. Presumably Caroline Maria Dewing, "Carrie", daughter of Dolphus Dewing and Sarah (Colton) Dewing. Mary E. Elkins of North Troy, Vermont; inscribed on May 16, 1882. Perhaps the Mary E. Elkins who would marry Charles A. Gardyne on December 18, 1889.
? Emery of Derby, Vermont; given name initial might be N or V or ? Appears to be the writing of an elderly person, so perhaps Mrs. Nancy Emery, born about 1818. Blanche M. Ewins of North Troy, Vermont. Blanche Mabel Ewins married Ervin Stowell in 1907. Lula B. Fish of West Derby, Vermont; inscribed at Derby Academy on October 4, 1881. Lula would marry Ora J. Parker on October 13, 1886. E. Gertrude Foss of Stanstead, Quebec; inscribed at North Troy, Vermont, on May 16, 1882. Gertrude would marry Loren S. Alden at Irasburgh, Vermont, on November 22, 1883. Orren A. Gallup; inscribed at North Troy, Vermont, on January 29, 1882. Perhaps the "Orin A. Gallup", who died of pneumonia at Troy, Vermont, on May 1, 1883. He was the son of E. J. Gallup and Anna (Blair) Gallup. Or the Orren A. Gallup who moved to California and died there in 1934. Alice M. Grow of Derby, Vermont; inscribed on September 16, 1880. Mentions "Grammar". Alice, the daughter of John and Susan Grow, would marry Walter D. Crane on October 6, 1891. Ida S. Hadlock of North Troy, Vermont; inscribed during the Fall Term at Derby Academy on September 9, 1881. Ida would marry Calvin M. Verbeck on December 15, 1884. Alma E. Heath of Derbe Centre, Vermont; inscribed on October 18, 1881. Alma would marry Harry Nelson Stevens in 1891. Martha E. Impey of Richford, Vermont; inscribed on September 8, 1883. Martha, daughter of William Impey and Josephine (Bliss) Impey, would marry John Dixon on January 4, 1890. It was presumably Martha's brother William E. Impey who inscribed the right facing page, and not her father of the same name. 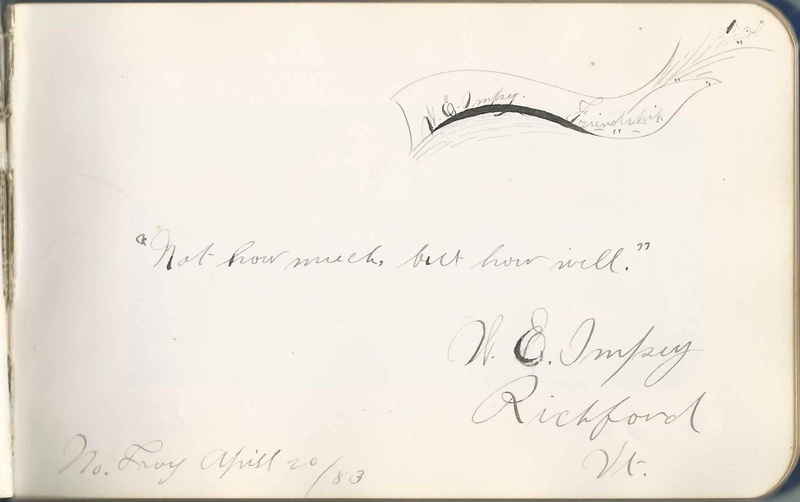 W. E. Impey of Richford, Vermont; inscribed at North Troy, Vermont, on April 20, 1883. Presumably William Elmer Impey the son and not his father of the same name. William, son of William Impey and Josephine (Bliss) Impey, was the sister of Martha E. Impey who inscribed the left facing page. Annie G. Kelley of Derby Centre, Vermont; inscribed at home on Saturday, September 17, 1881. Annie would marry John C. Hay on August 15, 1888. 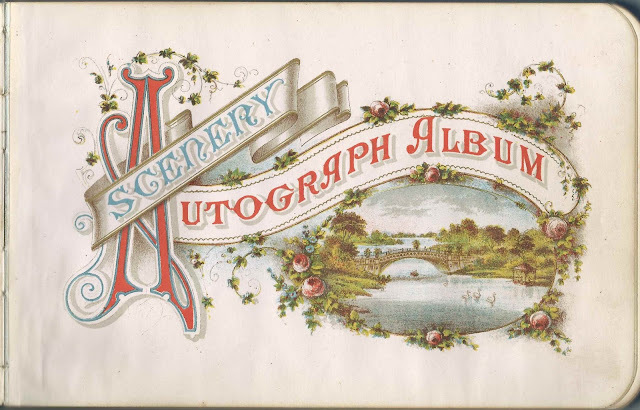 Gertie Kelley of Derby Centre, Vermont; inscribed on November 3, 1881. Her sister Mertie Kelley inscribed the left facing page. Sadly, Gertie would die on April 4, 1890. John E. Kelley of Derby Center, Vermont; inscribed at Derby Academy on November 8, 1881. Perhaps the John E. Kelly who would marry Anna Davenport. Mertie Kelley of Derby Centre, Vermont; inscribed on November 3, 1881. Her sister Gertie Kelley inscribed the right facing page. Presumably the Mertie E. Kelley who would marry John T. Thompson on January 31, 1893. Mary E. Kennedy; inscribed on 10-4-1881. Hattie's schoolmate. Rachel H. Kilborn of Derby, Vermont; inscribed on October 3, 1881. Rachel would marry Elmer E. Allen on September 3, 1884. A. M. Lawrence of Boston, Massachusetts. H. B. Lawrence inscribed the right facing page. H. B. Lawrence of Boston, Massachusetts; inscribed at Derby Academy at Derby, Vermont, on September 3, 1881. A. M. Lawrence inscribed the left facing page. Theodore Lawrence of Elkhart City, Illinois; inscribed at Derby Academy on October 12, 1881. Perhaps the Theodore Lawrence who would marry Ella B. Baker. Edna Litchfield of North Troy, Vermont; inscribed on September 30, 1881. Edna M. Litchfield would marry Asa Chandler Harris on November 25, 1886. Attie M. Magoon of West Derby, Vermont; inscribed on October 10, 1881. Presumably Atlanta May Magoon, who would marry Eugene O. Leavens on February 6, 1884. Lizzie G. Montgomery of Newport, Vermont; inscribed at Derby Centre on September 16, 1881. Perhaps Elizabeth Gertrude Montgomery who married Leslie Henry Hamilton. Minnie E. Paine; inscribed on September 17, 1881. Presumably the Minnie E. Paine who married Dwight L. Parsons on August 16, 1893. Mary Poore of North Troy, Vermont; inscribed on September 20, 1883. A Mary E. Poor of North Troy, Vermont, married Horace F. Webster on October 13, 1891. Julia A. Tracy of Johnson, Vermont; inscribed at North Troy, Vermont, on February 8, 1882. Sadly, Julia, daughter of Sylvester Newton Tracy and Sabrina (Chase) Tracy, died on October 9, 1884. Willie P. Wakefield of Brownington, Vermont; inscribed on September 28, 1881 at Derby Academy. Willard P. Wakefield married Marie A. E. Grosse at Wakefield, Massachusetts, on October 25, 1899. Hattie A. Young, album owner. 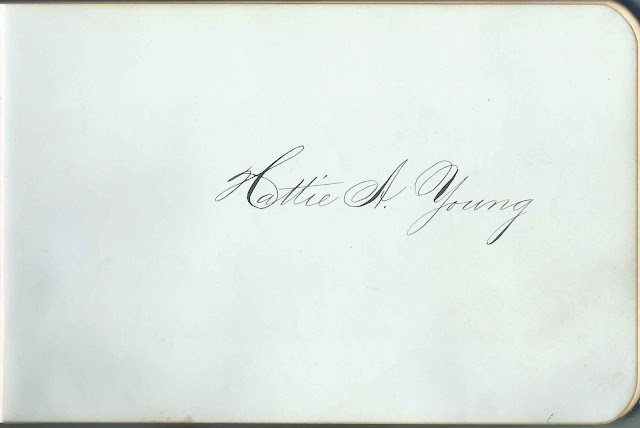 Presumably Susan Hattie Young, daughter of Edward F. Young and Katherine Bilodeau (LaJeunesse) Young, "Kate". 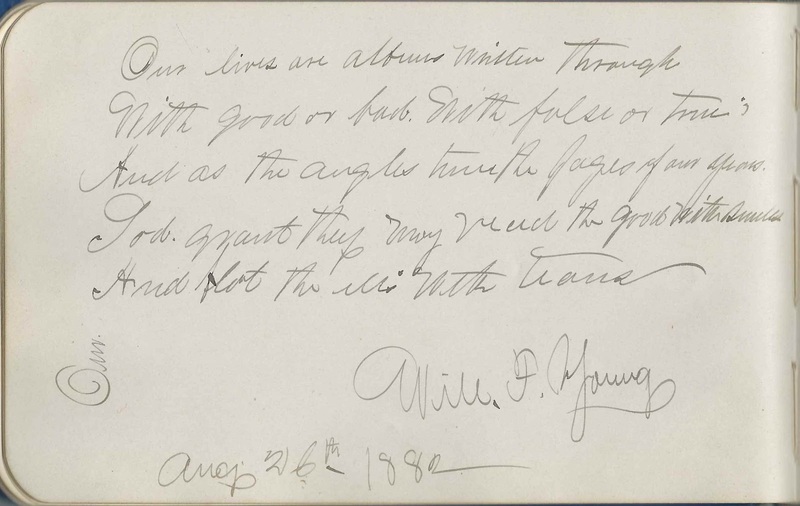 Will F. Young; inscribed on August 26, 1882. 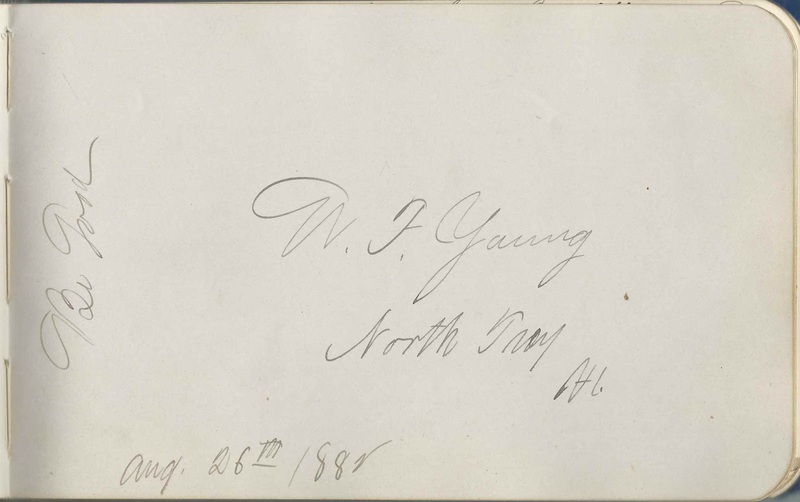 Hattie's oldest brother William F. Young; he also inscribed the right facing page. William married Effie M. Best on December 20, 1883. He moved to Brookline, Massachusetts and worked as a grocery dealer.